Background/Info: The Vomit Arsonist is Andy Grant. This is the fifth full length of this death-industrial project, which is already been active for numerous years now and each time again brings a sinister and deadly sonic exposure. Content: If you know the sound of Andy Grant, you directly will recognize the tormented format of his sonic creation. 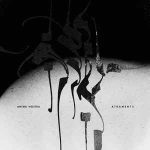 There’s a symbiosis between haunted atmospheres reflecting nihilism and despair at one side and the ghost spoken vocals accentuating the darkness of the work at the other side. The composition has been empowered by drones, which sometimes resonate like thunder. 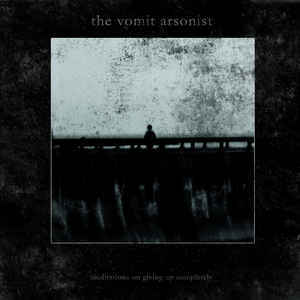 + + + : The Vomit Arsonist became one of the flag holders of the so-called death-industrial music. This new creation is even digging a bit deeper into the most haunted and even perverted corners of our brain while the artist just want to show… and maybe exorcise his own thoughts and frights about human mankind. This is an antidote to music that makes you happy, but it also is a masterpiece in its very own genre. The slow cadence of the resonating drones is adding an extra dramatic –or should I say tragic element to this composition. – – – : The only single reproach I could imagine, is that the tracks are pretty similar too each other. 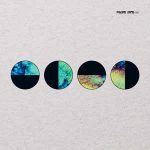 Conclusion: “Meditations On Giving Up Completely” clearly sounds as an invitation to leave a horrible world and it therefore also is a kind of dystopian sonic voyage that can’t leave you unaffected. Best songs: “What’s Left”, “When The Last Flame Has Been Extinguished”.